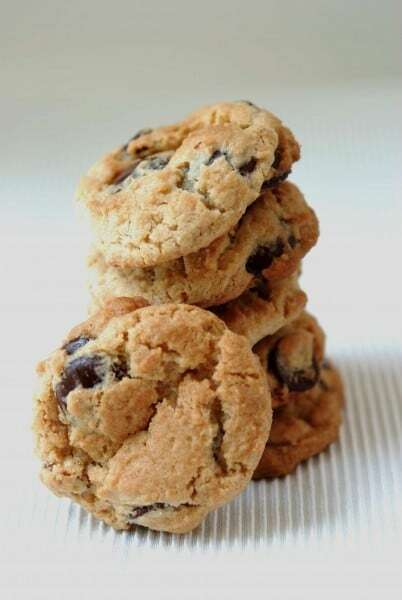 My Favorite Chocolate Chip Cookies are an adaptation of Jacques Torres’ famous recipe. The portioned cookie dough should be frozen before baking. Freezing the dough in advance keeps the cookies from baking up flat. Shout-out to my sister-in-law Carrie who asked for my chocolate chip cookie recipe. She complained about her recipe baking up flat. These don’t. However, you can’t mix them up and eat them the same day. Chilling is the secret. I like to scoop them out and then freeze, baking only as many as I need immediately. When it comes to cookies, and desserts in general, I like to make small ones. The original recipe predicted the dough would produce 16 cookies. However, I got 82 cookies. WOW! That’s a big difference. The texture of smaller cookies is somewhat different compared to really big cookies. Call me obsessive, but big ones induce more guilt than I can handle. Of course, the beauty of making chocolate cookies yourself is that you are in control of the size. Suit yourself. The original recipe was first published in the New York Times and is attributed to Jacques Torres. The options and freezing instructions are my own. Thanks for a yummy cookie, Jacques. 1 1/4 lbs. bittersweet chocolate chips. Using a mixer fitted with paddle attachment, cream butter and sugars together until very light, about 5 minutes. add eggs, one at a time, mixing well after each addition. Stir in vanilla. Reduce speed to low, add dry ingredients and mix until just combined, 5 to 10 seconds. Drop chocolate chips in (and nuts, if using) and incorporate them without breaking them. A #60 ice cream dipper works nicely for smaller size cookies (equal to 1 tablespoon). Dip onto cookies sheets covered with wax paper. (May be slightly touching each other). Refrigerate or freeze until firm. Store in a plastic bag until ready to use. Sprinkle lightly with sea salt (I usually forget this but it is surprisingly tasty) and bake until golden brown but still soft, about 12 minutes for the smaller size I like. Original recipe recommends dough be covered and refrigerated for 24 to 36 hours up to 72 hours. May be used in batches and can be refrigerated for up to 72 hours. However, I find the cookies are hard to dip after the dough is chilled so I like to portion it as soon as I mix up the dough. Wow these look amazing, the problem is when I get around to making them how can I stop myself from eating them all? Thanks for the recipe I will try them out definitely. These cookies look really good – I’ll have to try them! I use the chocolate chip recipe from the Joy of Cooking. these were really good! Thanks for letting me taste test! Another skinny secret…freeze the extra cookies & only bake what you need for that day, etc. That way you aren’t tempted to eat the whole batch at one time! The new look to the website is very nice!